This World Resources Institute working paper reviews corporate and facility-level mandatory reporting programs - from Australia, California, Canada, the European Union, France, Japan, the United Kingdom, and the United States - and identifies steps to implement a mandatory reporting program. The discussion is limited to mandatory programs requiring disclosure of GHG emissions (as opposed to voluntary reporting), and to facility and corporate level reporting (as opposed to national, regional, or city inventories). The United Nations Framework Convention on Climate Change (UNFCCC) Parties need to put forward emission reduction offers as part of the 2015 climate change agreement that is currently being negotiated. This paper suggests options for the design of this process, including the content of the offers and how they will be reviewed. Ensuring that this process is properly designed will be essential to creating an agreement that encourages a low-carbon, sustainable world. 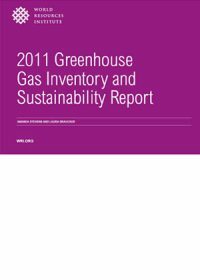 This report provides a comprehensive description of World Resources Institute’s 2011 greenhouse gas emissions inventory. It compares the 2010 and 2011 inventories, notes changes to base year emissions, and describes other sustainability activities. 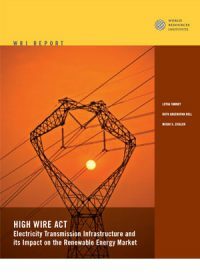 The report covers the period from October 1, 2010 to September 30, 2011. This working paper emerges from a collaboration of five leading research institutions: World Resources Institute (WRI), Institute for Global Environmental Strategies (IGES), Öko Institut, Renmin University of China, and The Energy and Resources Institute (TERI), based in the target countries. Researchers at each institution reviewed and gathered information from domestic and international data sources to create a richly nuanced but still comparable review of the development of these industries. The assessment attempts to uncover in particular how policymakers have cultivated successes. 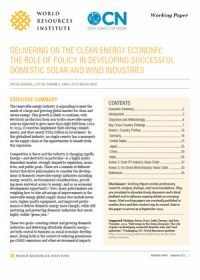 Countries have pursued a range of policies to accomplish these goals and there is now sufficient history in the solar PV and wind industries to begin to draw conclusions about whether countries have met their goals and what policy steps have been effective along the way. Recent studies suggest that the United States can greatly expand its deployment of renewable energy resources beyond current levels. This would reduce emissions of harmful pollutants and enhance energy security by diversifying the nation’s domestic energy supply. 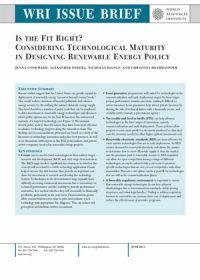 This brief describes a number of policy tools that can be employed to drive investment in renewable energy technologies and discusses which policy options may be the best fit based on the commercial maturity of a targeted technology. 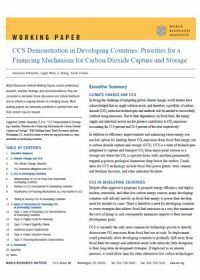 Existing financing for carbon capture and storage (CCS) is grossly insufficient to enable demonstration projects in developing countries. The few available funds are either spread over the full array of low-carbon technologies, or fall short of the magnitude or the mandate needed to propel commercial-scale CCS demonstrations forward. 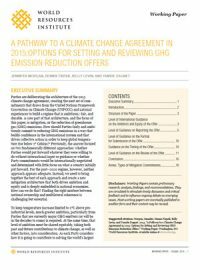 Current carbon offset mechanisms are not sufficient to spur CCS deployment in developing countries in today’s context either. Overall, existing CCS financing mechanisms help grow capacity, but their support is insufficient to leverage enough funding from capital markets to implement projects in a non-OECD context. This first attempt to develop best practices to responsibly implement CCS projects was based on a broad stakeholder process where WRI convened experts from academia, industry, and non-governmental organizations (NGOs) from the United States. In addition, WRI published guidelines for local community engagement on CCS projects in the fall of 2010. 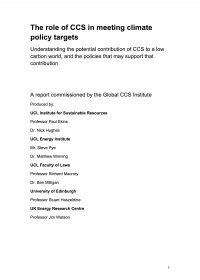 These had the input from experts and communities from nine countries around the world and cover potentially contentious issues for CCS project development in relation to disclosure of information, community engagement in the review and approval of plans, and public participation in general. Additional publications include briefs on CCS development in two critical markets: the European Union (EU)and China. Renewable energy, particularly electricity generated from sun, wind, and waves, has a critical role to play in powering a low-carbon economy. Despite its potential, the scaling up of renewable energy presents unique challenges. This paper examines transmission developments and challenges in the European Union (EU), China, and the United States—three regions that present entirely different pictures in terms of governance structures, institutions, and traditions for making decisions about transmission. 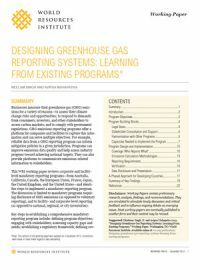 This policy brief, produced by the World Resources Institute (WRI), provides context, concise analysis, and recommendations to Parties for addressing carbon dioxide capture and storage (CCS) issues raised to date in the twin track United Nations Framework Convention on Climate Change (UNFCCC) and Kyoto Protocol (KP) processes.